AWARD-WINNING NOVELIST AUSTIN GROSSMAN REIMAGINES THE COLD WAR AS AN EPIC BATTLE AGAINST THE OCCULT WAGED BY THE ULTIMATE AMERICAN ANTIHERO--RICHARD NIXON. Richard Milhous Nixon lived one of the most improbable lives of the twentieth century. Our thirty-seventh president's political career spanned the button-down fifties, the Mad Men sixties, and the turbulent seventies. He faced down the Russians, the Chinese, and ultimately his own government. The man went from political mastermind to a national joke, sobbing in the Oval Office, leaving us with one burning question: how could he have lost it all? Here for the first time is the tale told in his own words: the terrifying supernatural secret he stumbled upon as a young man, the truth behind the Cold War, and the truth behind the Watergate cover-up. What if our nation's worst president was actually a pivotal figure caught in a desperate struggle between ordinary life and horrors from another reality? What if the man we call our worst president was, in truth, our greatest? 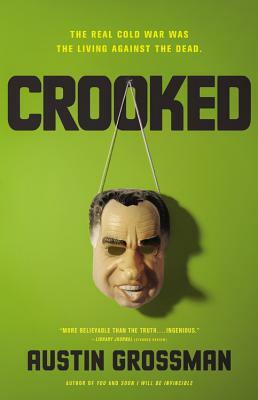 In Crooked, Nixon finally reveals the secret history of modern American politics as only Austin Grossman could reimagine it. Combining Lovecraftian suspense, international intrigue, Russian honey traps, and a presidential marriage whose secrets and battles of attrition were their own heroic saga, Grossman's novel is a masterwork of alternative history, equal parts mesmerizing character study and nail-biting Faustian thriller. Austin Grossman is a video game design consultant and the author of You and Soon I Will Be Invincible, which was nominated for the Center for Fiction First Novel Prize. His writing has appeared in Granta, the Wall Street Journal, and the New York Times.